Reach new career heights, and level up your ability to help others become their best self. Empower individuals with tools for leading a healthier lifestyle. Zero in on improving the quality of life of those in need. Does any of this sound like something you’d like to do? Giving Assistant joins forces with many not-for-profit organizations that enact positive change, but when it comes to our partnership with ACE Fitness, there’s a bit of uniqueness we’d like to highlight. The American Council on Exercise wears two special hats: one that reflects the passion of a nonprofit on a mission to spread health awareness and make physical activity available to the greater public. The second represents a brand you can shop that offers the type of essentials that not only better the lives of others but as well as yourself. When you use an ACE Fitness coupon from Giving Assistant, you’ll earn incentives and save money on ACE products and resources. Your purchases can also help further a good cause and a much greater objective. ACE Fitness is a powerhouse when it comes to the education, certification and support of professionals in the health and fitness industry. In over 30 years of existence, the American Council on Exercise has become the largest nonprofit of its kind with tens of thousands of life-changing professionals having completed one of four training study programs. provide vital treatment to those looking to overcome chronic disease and injury (as a Medical Exercise Specialist). And, good news! To make the next step in your educational journey a little easier to accomplish, Giving Assistant offers a variety of ACE Fitness promo codes that’ll help you save money on certification, training materials, and study bundles on the above programs. In addition to outfitting health and exercise professionals with accredited certification, ACE also partners with numerous local and national organizations to give back to the community. 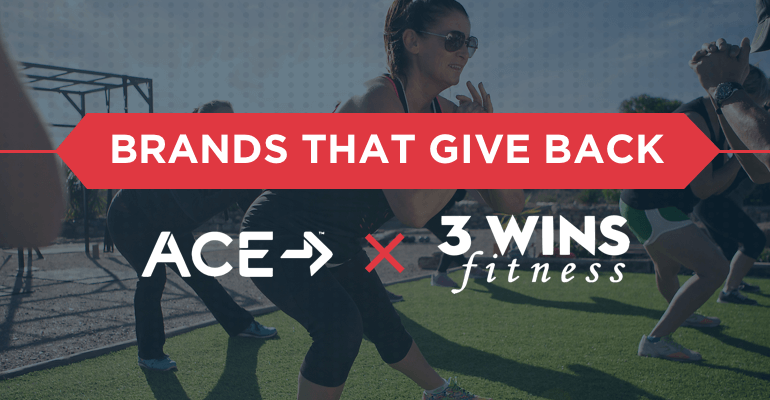 With headquarters in Southern California’s San Fernando Valley, 3 WINS Fitness is an outstanding example of the kind of nonprofit that ACE partners with. Both nonprofits work towards increasing community access to activities and opportunities that advance the physical health for all age groups and levels of fitness. In an effort to amplify the connection between kinesiology (the study of movement regarding the human body) and public health, 3 WINS Fitness grew from the vision of a handful of California State University Northridge students and a professor within the field that established a free community fitness program at a low-resource neighborhood park. Success! The response led to a much larger measure to connect future generations of health and fitness professionals to those in need of a realistically, attainable workout (and in some cases, life-saving opportunity that wouldn’t otherwise be available). So far, ACE has lent a hand to the education and advancement of roughly 100 kinesiology students, who help manage numerous 3 WINS Fitness sites across California, such as Los Angeles and San Francisco. Hundreds of locals in all shapes, sizes and ages sweat it out at weekly fitness classes – from curious couch potatoes having no routine exercise experience to newly inducted retirees trying to tame chronic diseases, like high blood pressure and diabetes. What makes 3 WINS Fitness a glowing success is the trifecta of benefits associated with their free community programs…truly a win-win-win situation. For starters, kinesiology students and volunteers receive class credit and invaluable, hands-on, job-related experience that far exceeds the basic strengthening of leadership and business skills. Secondly, participants gain access to free fitness classes. And, as a result, the overall community becomes stronger and healthier as residents get up and moving, transforming into more active members of society. The ACE Fitness and 3 Wins Fitness partnership proves physical fitness that motivates and changes lives doesn’t have to feel like a luxury…or uncomfortable visit to a crowded fitness center. You don’t need a fancy gym membership (and when options for physical exercise are running low), there’s always an option – like taking advantage of a session with 3 Wins Fitness. In addition to providing the public with essential information, instruction, advice and online tools that accommodate all fitness levels, ACE also sells products that make it easier for you to achieve your personal fitness and health goals. You’ll find ACE Fitness coupon codes on Giving Assistant that’ll come in handy the next time you need books, DVDs or fitness equipment, like a stability ball, FlexBands, or an ACE FitKit. Lastly, make sure you’ve downloaded our Giving Assistant Button, so you can keep up with the latest American Council on Exercise promo codes. We’ll keep you updated on the different ways you can save money as you work towards improving your career, health or overall wellbeing.